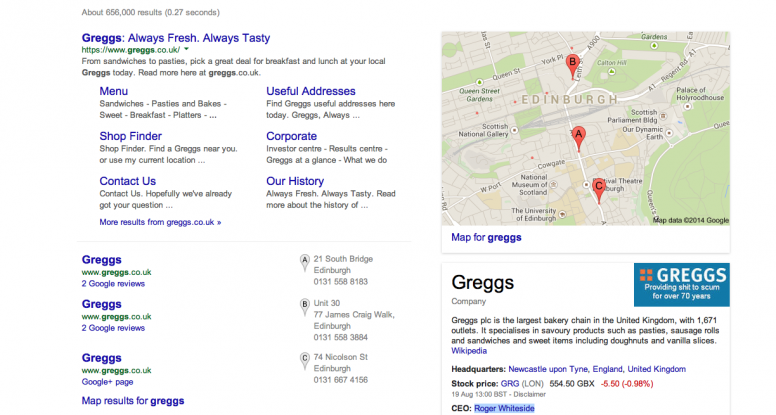 We all might laugh at this but possible not the CEO of Greggs Roger Whiteside who when we finds out that some toe rag has cleverly uploaded an images tagged it’s connected with their Google Places listing. "Providing Sh*t to scum for over 70 years"
How much third party information should Google use on our Places listings? Well i think this might be one image to far. 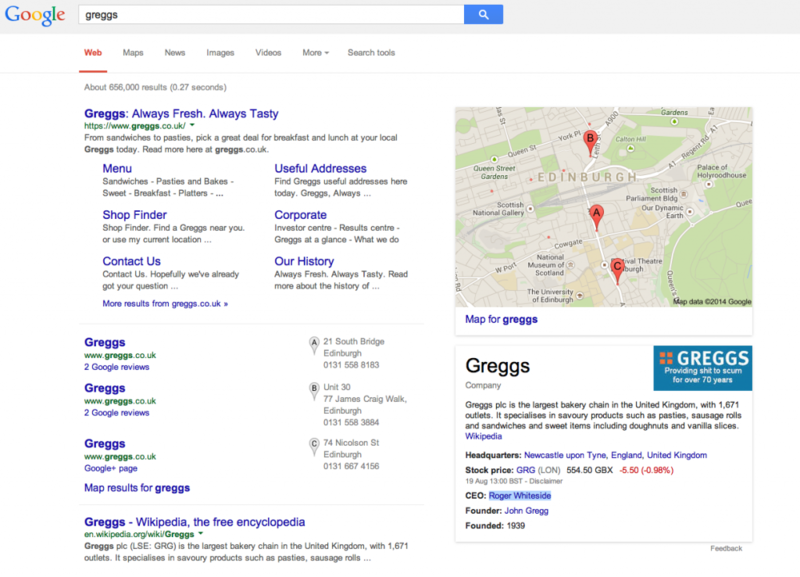 Google for a long time has allowed images and media such as video content and even reviews to be used from other reliable sources but when did http://uncyclopedia.wikia.com/wiki/File:Greggs_logo.png become a source of trusted content??? hmmmm! Other sources such as Picasa and Flickr have been used to support additional image information for years but this one, i think someone at Google HQ needs to take a look at this. While this bug is out there i’m sure there will be plenty more of these going around hopefully it will all get resolved fairly quickly. I’m going to tweet this @GreggstheBakers so hopefully they can start taking it down. This isn’t the first time we’ve seen these kinds of issues and i’m sure it won’t be the last but a word of warning to all business owners out there, always keep an eye on what is being said about your brand you never know what might happen one day. We work a lot and it’s not very often we get a chance to let our hair down and go wild so for this years summer party we’re going to do something a bit different from just hiring out a venue and having the usual disco and drinks! A good customer of ours Star Photo Booth has intrigued us since we very first saw their website. A photo booth was a completely new idea to us and although they are releatively new they have been around for a few years but they have gained more popularity in the last 12-24 months in particular. Whilst helping a client correct a problem with their Google Places listing we came across something interesting we thought we’d share. kitchens edinburgh, bathrooms edinburgh, kitchen showrooms edinburgh, bathroom showrooms edinburgh. This was in July 2013 and the client obviously wanted more enquiries but just couldn’t get their Places listing to respond. First job – Digging the dirt! First job was to find out the history of the listing and also the account or in this case ‘accounts’. They had 1 listing in their own account which was live. But the previous SEO agency or whoever had for whatever reason to create another. Maybe they did this intentionally to try and boost their rankings. Obviously this isn’t ever a tactic you should use. After looking at all the information in both accounts we decided to delete the secondary one the SEO agency had added previously and run with the older list. This makes sense for many reasons, aged listings work better and you should always try and use the original one if you can. Now we know which listing to use in which account, first problem solved. We removed all the spam from the description and then completed all fields so that the listing was 100%, it was previously 76-86% completed i can’t remember the exact number. The URL added for some reason on this listing was http://www.ekco.co.uk/bathrooms-edinburgh so we changed that to the home page as was more relevant. The next bit didn’t require us to do anything we just had to see if the listing would start showing in the first 2 pages. 2 weeks later and we have a result. It wasn’t page 1 but it was showing which meant the errors had been resolved and we could now start optimizing. It’s now 12 months on and the listing keeps going from strength to strength and dominates many of the search terms it is targeting. We still have more to do but the organic results have a big part to play in this as well. One of the most interesting finds we had was that Google marker edit wasn’t working on this listing. We’ve reported the bug but not heard anything back. Hopefully we’ll be able to report back with more news for the Edinburgh Kitchen Co soon. Although we don’t post as often as we used to simply because of how insanely busy it is we are always speaking to our customers and keeping them informed of goings on in the Google Places world. Sorry the Google+ Local world, I still can’t get used to that, it’s such a mouthful. A lot has changed in the past 18 months, but all change is good change as they say. We;; maybe not the seemingly endless amount of Google places glitches and bugs, but we are still getting clients listings top of the first page. We no longer read the blogs or get involved with public fixes. To be honest I was spending way too much time helping non-customers and in return for no thanks. Just didn’t make sense to keep pushing myself for every man and his dog. All our efforts are 100% in to our customers, we’re giving nothing away free, no free support, no fixes only our customers are privvy to that information. We have over nineteen years of industry experience, making us one of the leading IT support companies in London for IT support London, IT Outsourcing London. The truth about Google Places listings. You can’t cheat Google and expect to get away with it without getting a blackmark against your name. You’re not smarter than Google, it’s their world and you’re playing by their rules. Do you really need more than one listing? Unless you’re business is located in different cities then stick to one listing. Virtually nothing you can do to change the on page listing details had any affect on your ranking. The only time this actually works is when it’s an area that has very low competition. City central postcodes make no difference what so ever. FACT! Listings take approximately 3 months to get found first page. Of course it would be by default but it has been exceptionally busy this week. 3 new starters signed up and we’re already seeing results for them. London is a popular place, probably 80% of all our requests are for London based searches. We probably get 2-3 for the same categories each month but unfortunately we only work with 1 per area. Great for our clients though. Catch up with you all soon! Last updated by Tom Peary at May 28, 2012 .